Oyster Reef Golf Club opened in 1982 and was immediately recognized as one of the Top 25 new courses in America. 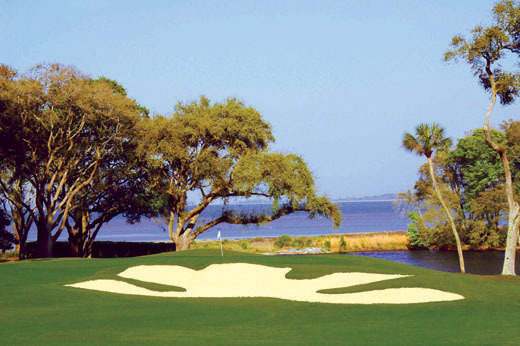 This Rees Jones design received 4 stars on the 2008-2009 Golf Digest list of the “Best Places to Play,” has been voted one of the Top 20 Courses in the Carolinas and enjoys a reputation as a favorite course among Hilton Head Island golfers. Carved out of 190 acres of breathtaking low country terrain, Oyster Reef’s spectacular 18-hole championship layout winds the golfer around lagoons, lush vegetation, and scenic views of the inlet to Port Royal Sounds, including the signature Par 3, # 6, one of the most recognized and photographed golf holes on Hilton Head Island, looking out over Port Royal Sound.